*disclaimer*: you are learning how to cook steak from someone who never knew how to before but obsessed over the course of three days and six bad steaks until she got the seventh just right. she also has no fancy tools. just her cast iron, a pair of tongs, and the stubborn determination of a perfectionist. hey fransss! this is my first post as an ex-parisienne brooklynite! one full week has passed and there’s been a lot of unpacking, cleaning, reacquainting myself with american things like great bagels or people speaking english, and lastly, occupying 30% of my brain space thinking about all the friends and food i miss in paris. along with the baguettes, terrine, and natural wine, i often think about this perfect pepper crusted steak from le hibou in odéon that comes in a dreamy puddle of this silky flavorful red wine reduction. on good and bad days, one of my favorite memories in paris was finding an ideal seat on their terrace to people watch, enjoying this steak, while washing it all down with a glass of red wine. i’ve never been too much of a red meat eater because of all the unknowns: where it came from, how it was processed, what the cow was fed, how it was treated, the artificial hormones, infections and antibiotics it carries, and ultimately how my body would absorb it all. the eu has more restrictive laws around animal meat vs. that of the u.s. which requires us to do more research on not only how and what to consume, but also where to find it. i think the most important thing to know is what the cow was fed and how it was treated. most cows in the united states are fed grains supplemented with corn and soybean (feed that is also harmful to our planet) and given antibiotics, all in an effort to maximize meat production at the cheapest cost. it’s unnatural and harmful for not only the cow, but also for our bodies to consume. support local butchers and restaurants who have direct relationships with their beef suppliers that grass graze, grass feed, and do not feed or inject growth hormones and antibiotics. change your mindset about the cost of beef because it is expensive to produce beef properly and naturally. grass fed beef is naturally fattier, tender, and most importantly, tastes better. if you’re in it for the flavor and quality, ya gotta pay for it! i’m lucky to live in a metropolitan city that has access to almost anything at my fingertips. 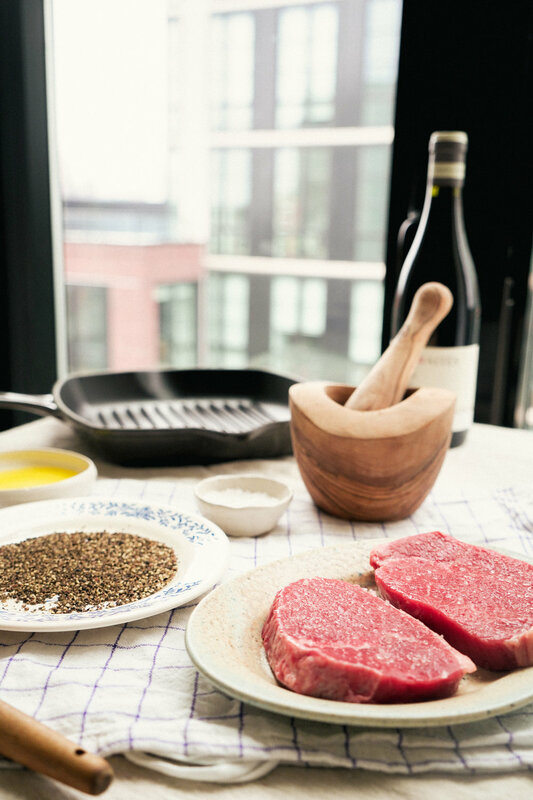 if you search good ol’ google for “grass fed beef + your city” hopefully you can find some butcher shops close by but if not, you can also order it online and have it delivered to you. in brooklyn and new york, you can find some quality stuff at paisano’s and hudson & charles. if you have other or better recommendations that you’re passionate about, feel free to shout it out here! if you’re also new to this, test ONE steak first. don’t be a ding dong like me and waste learning opportunities by cooking two steaks using the same method at same time. yeah, i’m embarrassed admitting this mistake. prepping the steak (learned from salt fat acid heat): salt all sides of your steak using kosher salt 30 minutes-1h before cooking. salting is pure magic in that it removes moisture from the steak which then transforms into a brine that absorbs into the meat to break down tough proteins in the muscle - all the way into center too! but only if you let it and give it time. don’t use those grill pans because i believe it’s just for #aesthetic purposes to get grill marks which is to me, kind of silly. instead, use a flat cast iron to not only maximize your crust surface area but also get your steak to cook more evenly throughout. use oil to pan fry the steak vs. butter. because you need to get your cast iron to heat up to create some smoke and because oil has a higher smoke point (~400 degrees F) than butter (350 degrees F), oil will be your bestie. baste with butter after your steak is cooked to get delicious flavor and a beautiful shiny sheen. cook the edge with the fat first because the fat will cook down and render and flavor the oil. using tongs, hold the fat edge up on the pan until it crisps up and turns a nice golden color. that rule about not flipping your steak - throw it out the window. but do make sure that you have a good crust on the first side before flipping (~30 seconds to a minute). i found that giving multiple flips made the steak more evenly cooked throughout. you don’t have to finish it in the oven i used two steaks by finishing them in the oven at 450 degrees for 2-3 minutes. they came out more medium and it’s kind of unnecessary to do this in my opinion. a good pan fry is sufficient! 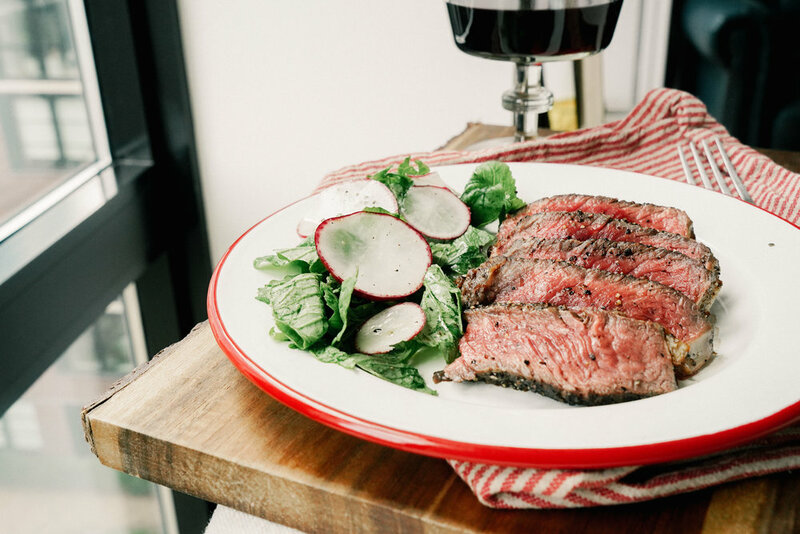 let your steak rest for at least 5 minutes on a rack before serving or basting with butter: this one is obvious or maybe not but j. kenji lopez-alt did like the longest study of the importance of resting meat to keep the juices from spilling out. more here! lay first side of steak on pan and cook for 30-45 seconds and flip to the other side. do this 2-3 times until you get a good golden crust. it’s okay for the exposed outer rim of the steak to look purple-ish gray. the inside is what counts!